500 Forward is a collaborative community effort between the Indianapolis Motor Speedway, partner organizations and individuals to celebrate the Indianapolis 500 presented by PennGrade Motor Oil and the Month of May. Now in its second year, 500 Forward harnesses the collective efforts of 13 partner organizations and countless individuals alongside IMS to offer programming and events that celebrate the Month of May and support a broad array of community initiatives. Organizations participating in 500 Forward include the 500 Festival, Arts Council of Indianapolis, City of Indianapolis, Downtown Indy, Hamilton County Tourism, Harrison Center for the Arts, IMS Museum, Indiana Humanities, Indianapolis Airport Authority, IndyHub, IndyCog, Speedway Chamber of Commerce and Visit Indy. In partnership with the Harrison Center for the Arts, Central Indiana residents are once again encouraged to celebrate the Month of May with officially registered porch parties. Everyone loves a good party, and Indy 500 Porch Parties are no exception, as more and more took place last year throughout Indianapolis. There’s no better way to welcome the arrival of spring and the most magical month of the year in Central Indiana than by holding your own racing-themed porch party! Register your party now to be eligible for special surprises, deliveries, celebrity drop-ins and ticket giveaways. Party hosts also are encouraged to deck out your homes and front yards all month long to show your racing heartbeat and what makes the Month of May special to you. Show that pride through your Porch Party photos on social media, too, tagging with #PorchPartyIndy. 500 Fashion Fridays unites race fans, fashionistas and everyone who wants to show some Month of May style in a partnership that continues with Downtown Indy Inc. Workers in downtown Indianapolis and across the city are encouraged to incorporate racing and the Indianapolis 500 into their outfits during the four Fridays of the Month of May. This year, photographer Polina Osherov of PATTERN and the Indianapolis Motor Speedway teamed up to organize a fashion shoot highlighting the many ways fans can participate! Visit Pattern’s website (www.patternindy.com) in May for a behind-the-scenes look at the shoot and to learn more about the program. Be sure to follow us on Instagram and Twitter for weekly inspiration! With the help of Susan Decker Media, we are teaming with restaurants around the city to offer discounts every Friday in May when you come in rockin’ your best #500FashionFriday style. Be sure to keep an eye out for checkered banners throughout the city and strike a pose in your best Indy 500 or racing-themed wardrobe. To read more about our partnership with PATTERN and to see a list of participating restaurants visit PatternIndy.com/500FashionFridays. Join the third annual group bike ride to the Indianapolis Motor Speedway on Race Morning of the 102nd Running of the Indianapolis 500, organized by our partners at IndyCog. This year’s ride will take place on Race Day, Sunday, May 27. Riders will gather at City Market in Downtown Indianapolis before heading out together on a safe, monitored bike route to the Indianapolis Motor Speedway. Let’s keep the wheels turning to the track for year three! In the Welcome Race Fans program, five area artists commissioned by the Arts Council of Indianapolis each will create a piece on various mediums that incorporate the term “Welcome Race Fans.” These pieces are displayed around greater Indianapolis, including the Indianapolis Artsgarden, the Athenaeum and Indy Reads Books buildings in the popular Mass Ave dining and entertainment area, and in the Irvington neighborhood. Another art tradition, Indy Wings, returns this year as part of the Welcome Race Fans program. Indianapolis graphic artist Aaron Scamihorn created this year’s “wings” – an ode to the famed IMS “Wing and Wheel” logo – that were placed on buildings and on business fronts throughout Indianapolis and Central Indiana, providing a perfect photo opportunity for fans, pedestrians and business customers. Locations include Mass Ave and Broad Ripple in Indianapolis, Main Street in Speedway, and in the communities of Noblesville and Westfield. Another new part of Welcome Race Fans that will engage the local arts community will be the painting of an IndyGo bus with an IMS racing motif by local artist Amy Rheinhardt on the grounds of IMS during two weekends of track activity during May, the INDYCAR Grand Prix on May 11-12 and Indianapolis 500 qualifying on May 19-20. The bus will be used as a cooling station for fans on Race Weekend May 25-27 and then be placed into service on IndyGo routes after May. Enjoy activities and programming in Downtown Indy all month long by checking out Georgia Street Wednesdays and Fridays in May. Work on your fitness each Wednesday in May by joining IMS and other racing personalities for Workout Wednesday on Georgia Street from noon-12:45 p.m., rain or shine. You can also fuel up for the weekend by joining IMS and Downtown Indy, Inc. for Food Truck Fridays on Georgia Street. Grab lunch from your favorite food truck from 11a.m.-2 p.m. each Friday in May. Don’t forget to dress in your finest #500FashionFriday outfit for special offers and lunch discounts! The Indianapolis Motor Speedway almost never sleeps during May, and neither does nearby Main Street in the Town of Speedway! One of the events to highlight and circle on your schedule should be “Behind the Wheel” on Saturday, April 21! Get a behind-the-scenes look at the world of racing and learn about how we all work together to stage the incredible Month of May! If you’re more on the athletic side, make sure to sign up for “Run with a Racer” and join the Speedway Running Club as runners venture through the streets of Speedway and grab a brew or two after! As Race Weekend quickly approaches, make sure you stop on Main Street for the 12th annual “Rockin’ on Main” on Carb Day evening, Friday, May 25. Visit the Speedway Chamber of Commerce for more information. Downtown Décor Invasion is a collaboration with Visit Indy, the Indianapolis Airport Authority and Hamilton Country Tourism to ensure the characteristic hospitality of Indianapolis is obvious for visitors during the Month of May. Make sure to grab your photo with the huge Month of May-themed decal on the JW Marriott (we hear the view from the parking garage across the street can’t be beat!) or search the streets for your favorite driver with our commemorative street signs! View Street Sign Locations. Traveling in or out of the city? Make sure you snag a photo with the autographed-filled Indy car in Civic Plaza at the airport and check out all the décor at more than 30 hotels in Indianapolis and Hamilton County. When staying in the Indy area, ask your concierge or check out one of our information tables with schedules, maps, great local restaurants and more! In another collaboration with our friends at Visit Indy, the Indianapolis Airport Authority and Hamilton Country Tourism, we have worked to ensure hospitality is turbocharged for visitors during the Month of May! Visit one of the more than 30 hotels throughout downtown and Hamilton County and ask the front desk for anything you need to know about May. They’ll be ready to help! IMS Historian Donald Davidson is continuing his speaking tour throughout the region promoting the Indianapolis 500 and its century-long ties to communities throughout the state and beyond. This is the third consecutive year the popular and beloved Davidson has shared his incredible knowledge with fans through these chats and question-and-answer sessions. 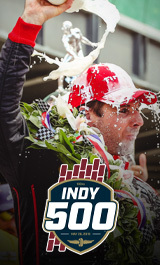 500 Gives Back is a grant program administered by the 500 Festival, as a legacy of the 100th Running Host Committee, that supports community organizations implementing life enriching events, activities and programs while also celebrating the spirit and legacy of the Indianapolis 500. Make sure to visit 500 Festival’s website to learn about the worthy 2018 recipients!